« When was the last time Tottenham finished above Arsenal? Peter Edwin Storey was one of the key players in the Mee era – he came into the first team a year before Mee arrived and left a year after Mee met. He is a man who, perhaps almost more than anyone else in the team, I would want to say thank you for all the memories. I’ll try and explain why. He started out playing either both right and left back, making his debut appearance for the first team in October 1965. He then kept his place alternating between number 2 and 3 on the pitch as needed. In fact the Double season of 1970/1 was the first in which he played as midfield, wearing either the number 4 or 8 shirt – although effectively he was throughout the remainder of his career the defensive midfielder, winning the ball, moving it forwards. He played in both the League Cup defeats before getting the three medals of Mee’s era. He also played his first game for England in the Double year (at right back) and played 19 times, taking over from another hard man: Stiles. In fact, Peter made more England appearances than any of the other double winning team. He played one season for Terry Neill taking him to 501 first team appearances in the league and cups, before going to Fulham for £10,000. He played one season there before retiring. Unusually for a footballer, Peter’s autobiography is quite readable and interesting. Called “True Storey‘s; My life and crimes as a football hatchet man,” it is interesting because it does not lead to the suggestion that Peter was a violent crook, which is the story usually told. Rather he suggests he was a fairly ordinary lad, on the tough side of the line, but not exceptional, whose life has been made up for him by the media, interested as always only in today’s sales, not today’s truth. The revelations are interesting therefore because they are so unexpected – like the fact that he shared a bungalow with Terry Neill. In football terms he talks about his approach to the contact sport – and it reminded me at once of the advice I was given as a not particularly strong or big lad growing up on the streets of Tottenham in the 1950s. “The first time you hit him, give me everything you have – your most powerful hit ever. If he doesn’t go down, then run as fast as you can.” Good advice – and Peter simply applied it to the pitch, staying as close to the laws of the game as possible. From what I can gather he was fined £700 for running the brothel in Leyton High Street (Leyton High Street of all places) and got three years in prison various things including car theft, the gold half sovereign scam and the like. I am not too sure where Peter Storey is now – the current word is he lives in France and has two sons who are regulars at the Emirates. He must know, I am sure, that for those of us who were there, he was a great hero, a man on whom we could all depend, the man who no matter what would never let Arsenal down, and never let the fans down. That, surely is worth everything. Peter Storey, for everything you gave us during those years, thank you. 15 comments to Peter Storey: the man to whom I would most like to say thank you. Storey, like McLintock, Graham and Charlie George, is one of the players from that Double team that became Arsenal heroes after having their position on the pitch changed. Some of those changes were down to injuries to others but mostly it was down to the brilliance of Don Howe as a coach and tactician. He saw that McLintock could, despite his lack of height, play as a centre-back (rather than midfield) and that George Graham could be a far more successful goal scorer in midfield than as the orthodox centre-forward that he had been tried before. One of the great pities is that Ray Kennedy was sold to Liverpool (£200,000) as a striker and only then became one of the most successful English midfielders ever seen. Howe said later that he would have made the same change had he still been at Arsenal. On the other side of the arguement is of course the fact that, if Kennedy had successfully filled the left side of midfield would we have ever seen Liam Brady there? Peter Storey is the reason I am an Arsenal fan. He is my late fathers cousin – something which fills me with pride to this day! Whenever I tell people of a certain age that I am related to Peter the first thing they say is usually ‘ what a hard b*****d he was! ‘ but it is then quickly followed by ‘ but a bloody good footballer as well ‘. Speaking of Ray Kennedy, he is from Seaton Delaval in Northumberland – which is where my father is from as well – and he lived directly opposite my Grandmother and was best of friends with my Uncle John, which is why my dad and uncle both supported Arsenal. I remember Peter Storey as a genuinely hard man. I saw various Leeds players trying to provoke him in various off-the ball incidents at Elland Road, including raking studs down the back of his leg, kicking his achilles tendons, and stamping on his hands. Peter simply did not react, other than by staring into the faces of his assailants. Peter’s talent as a player was never given proper recognition by the media, which portayed him unfairly as simply as an enforcer. He was a key member of the Double side, who played a major role in the team’s success. Thanks to Tony Attwood for another good write/read. Nice responses too, especially as two are family. What can I say that the four respondents haven’t already, other than his nickname was ‘Snout’, I believe. Pathetic offering, sorry. Regarding Anthony’s statue comment, I would hope a statue of a 1970/71 figure will appear sometime in the future. If so, I think it will be Bertie as manager (1st choice), or Frank (captain). As a lad I used to stand on the North bank every fortnight from 1970 to 76 until my parents moved, ripping me away from the love of my life Highbury. Believe you me Peter Storey was my boyhood hero and to this day with all the great players to pull on the hallowed shirt, is still in my mind the greatest! If in recent years we had a player with the engine, determination, drive, grit, link play and sheer love of the club, feeding the players further forward we would surely have won far more! For whatever Peter Storey may have been caught up in (and that’s all it was) post hanging up his boots, I for one don’t hold it against him. To me I will never forget his time in an Arsenal shirt and for everything he stood for……… Peter YOU were the best! Just finished reading True Storey..an excellent read..well written. An underrated player who will always be an Arsenal hero to me! I too recently read the book. Despite how he was treated at the end of his time at the club, his love of the arsenal is clear to see. We are always reminded how the double winning team of 71 contained a local lad/supporter (the equally great Charlie George) but the fact that Peter was a boyhood gooner is often overlooked. I never saw him play but my late father always said he was a fantastic player and all the stuff said/written about him just being a man marker/spoiler was rubbish. Truly one of the Arsenal greats! During the a Chelsea cup game at the Arsenal Hudson when taking a throw on spat into Storey s face Storey would put vasaline on his eyebrows to stop perspiration running into his eyes,he didnt react,however about ten to nine Hudson could be seen to be turning graceful somersaults over the halfway line.A underated player in a underated team led by a underated manager all unfairly. I loved that team back in the late 1960/70s. I used to stand in the North Bank with my friends wearing my red and white scarf white pride. I loved Peter Storey, he was my hero! I used to see him and many of the Arsenal players in the White Hart pub in Southgate, before players got too precious to mix with us commoners! I was there at the 1971 Cup Final with my dad. It was a dream come true. Since then I’ve managed to get Charlie George, John Radford and Big Franks’s autographs and I would love to get Peter’s one day. Peter Storey was indeed a great footballer and was not to be messed with. I wish there were more players like him today. He is a legend! I sat next to Peter at Yeomans Bridge School, we were both in the A Stream. When playing football with him you won every week. So fit at 14, he could beat our PE master at cross country. We opened the batting for our school against Robert Haining School, we put on 50 for the first wicket, A true sportsman, winning was everything and why not, you don’t play sport to come second. He lived in the same road as me, Ashdene Road ,Ash and in the summer he would go running around the village early in the mornings to keep fit. Occasionally he would come down and watch us play football in the Farnham Sunday league in Ash, we were bad, but we enjoyed it. Good luck to where ever he is, proud to have known him. Loved the man – standing on the Northbank there was no finer sight than to see “mower” as I affectionately remember him going for a ball where he had at best a 40% chance of getting it, the stadium would go quiet for a couple of seconds & then roar as he set up another attack :)One of my best memories is when Leeds came to Highbury, Jack Charlton stood on the goal line as he usually did when Leeds had a corner. There was the usual skirmish to get to the crossed ball, which Bob Wilson did nicely & Peter finished up on the deck – Charlton stamped on his chest, Peter got up turned to the Northbank & grinned & brushed the stud marks on his chest. Charton was destroyed for the rest of the match, couldn’t do anything right. A true mans man & I love him for the great memories I have from that time. Hall of fame player for me. 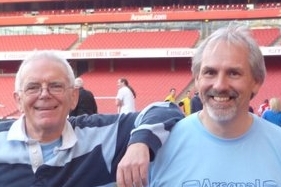 I am a genealogist from Glasgow Scotland, Back in 1965 My uncle introduced me to a man called Peter Storey, My uncle was an Arsenal fan, He would leave work on a Saturday and cross the road to see the gunners play. As now a near 60 year old I follow the gunners even if it’s just to check how as I would say my uncles team are doing. I would love for any of the Storey family to get in touch. Angus, Peter Storey Moore didn’t play for Arsenal he played for Nottingham Forest. Peter Storey played for Arsenal and then Fulham. Ian Storey Moore played for Man U, Nottingham Forest and Chicago Sting.